Well, maybe it’s not entirely about the shoes, although they do promise to share a starring role with my just-completed yellow and blue linen dress. 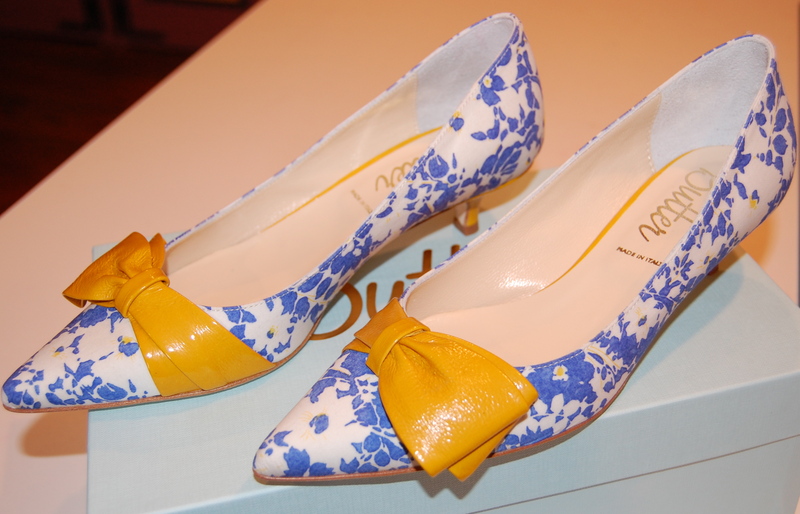 I first spied these lovelies on the Simply Soles website last winter, as part of the offerings for Spring/Summer shoes. 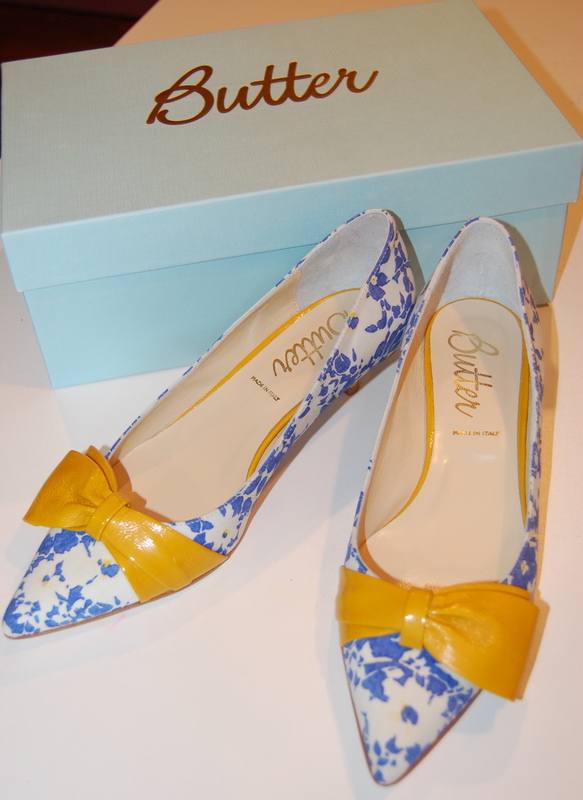 Although I loved everything about them (the combination of colors, the fabric, the asymmetrical bow, the kitten heel, the brand – knowing from experience that Butter shoes are extremely comfortable), I decided not to purchase them. At that point in time, I had not yet bought the bittersweet yellow linen, so I had no reason to buy shoes with such a limited color palette. By the time I had a good reason to buy them, they were no longer available in my size. However, the Simply Soles website allows one to request an email advice should the correctly sized shoe become available. Weeks went by, Summer arrived, and by then I had paired the recently purchased deep yellow linen with the pottery blue linen. Goodness, I could not stop thinking about those shoes and how perfect they would be with my envisioned dress. And then – they were suddenly available – in my size – and on sale! By this time I was already immersed in making my second linen dress of the Summer, so I planned for the blue and yellow linen to be number “3”. 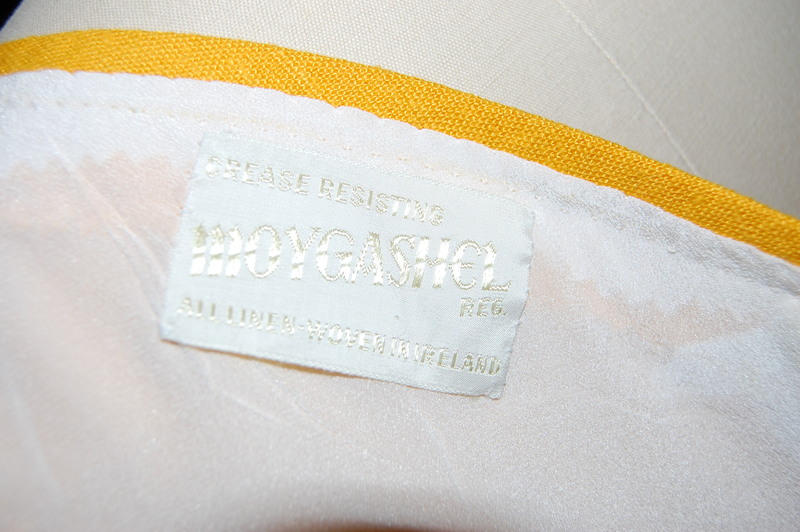 In the meantime, I happened upon more documentation of Moygashel linen, this one for the “yellow” piece. Those of you who follow this blog know how much I love to make these connections! 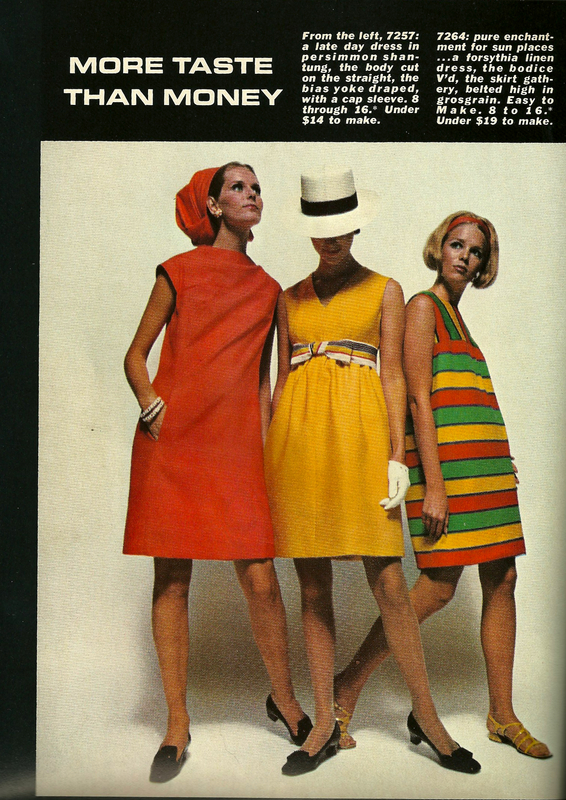 “… pure enchantment for sun places … a forsythia linen dress …” and the source information in the back of this Vogue Pattern Book Magazine from February/March, 1968 credits Moygashel as the brand of linen. Seeing an entire dress made out of the forsythia linen helped me to feel confident about having such a bright color as the bodice part of my planned dress. As I stated in my last post, I decided to use the bodice from this early ‘60s’ Vogue pattern, pairing it with a slim skirt and a belt. The neckline dips down to a slightly curved V, with a center seam. As this would be a dressier type of frock, and because I know how foolproof couture construction is (with silk organza underlining and crepe de chine lining), I proceeded using those techniques. The facings on the V-shape of the bodice front and back were cut as part of the pattern, instead of being separate pieces. I followed the instructions to reinforce the edges of the fold with ¼” twill tape. I basted the twill tape just to the outside of the fold line on the “all-in-one” facing. This is the back bodice. And this is the front bodice, showing the deep V and the center seam. Normally, couture construction does not use facings, but in this application, they were indispensible. Then the rest of the dress proceeded without a hitch. Here is the dress turned inside out. 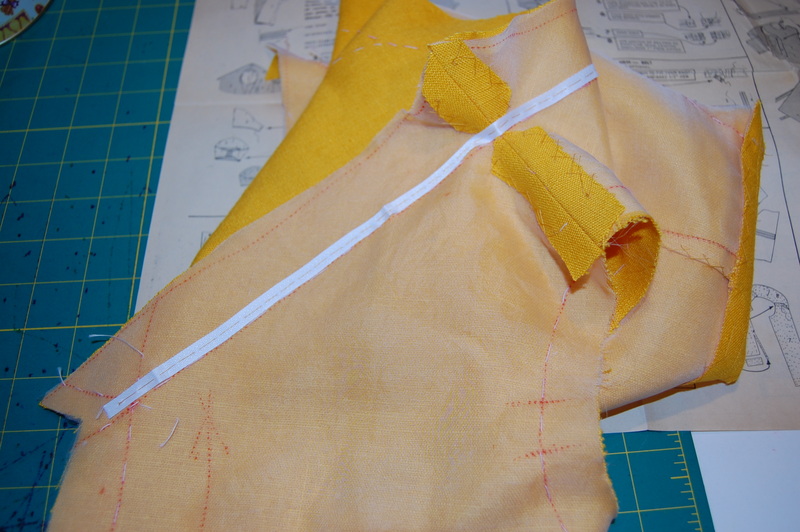 I used a forsythia-yellow zipper as I thought it more important to match the bodice than the skirt of the dress. Here is an inside look at the crepe de chine fell-stitched and understitched in place around the shouilder. Note the lingerie stay made with a folded piece of Hug Snug rayon woven tape. About halfway through the construction of the dress, I got the idea to have decorative buttons made – to compliment the front V of the neckline. I actually was not sure I was going to use them until I had finished the dress, but I think they add just the right amount of detail. Here is the dress without the buttons . . .
. . . and here is the dress with the buttons. What do you think? With or without? Another detail I was happy to add was the Moygashel linen label which had been attached to the forsythia yellow linen yardgoods. I attached the label inside the back neckline. The belt is also a Pat Mahoney product, made from a silk dupioni. I like the V-ed back! The similarities with my shoes are remarkable! 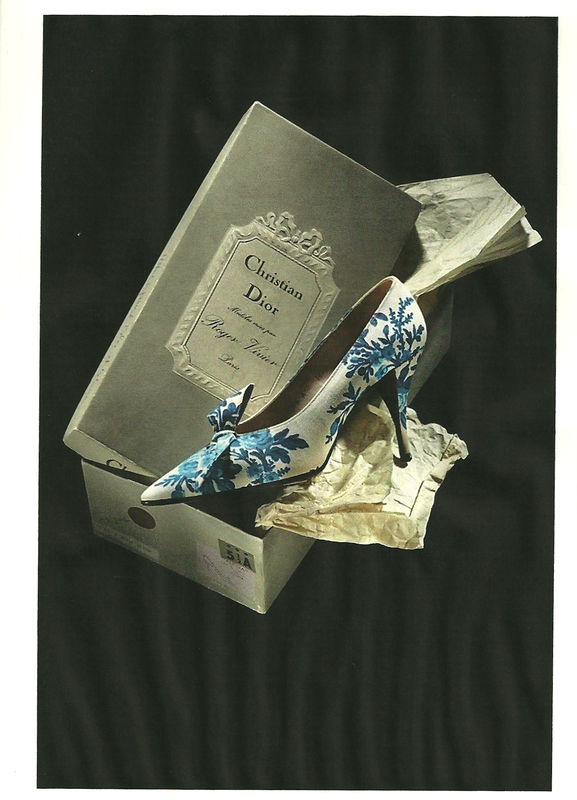 Now that I have one dress perfectly suited for my Christian Dior-inspired shoes, I will be looking for other “perfect pairings”. Who knows what fabric treasures will present themselves next Spring or Summer for just such an undertaking? Awesome look! It gave me some ideas of how to use two pieces of silk that my daughter brought me from Thailand. Silk from Thailand sounds wonderful!! Thanks so much for reading and commenting. You have stated that so well, Cynthia – couture techniques do seem to honor special fabrics. Thanks so much for your lovely comment! Meant to be! 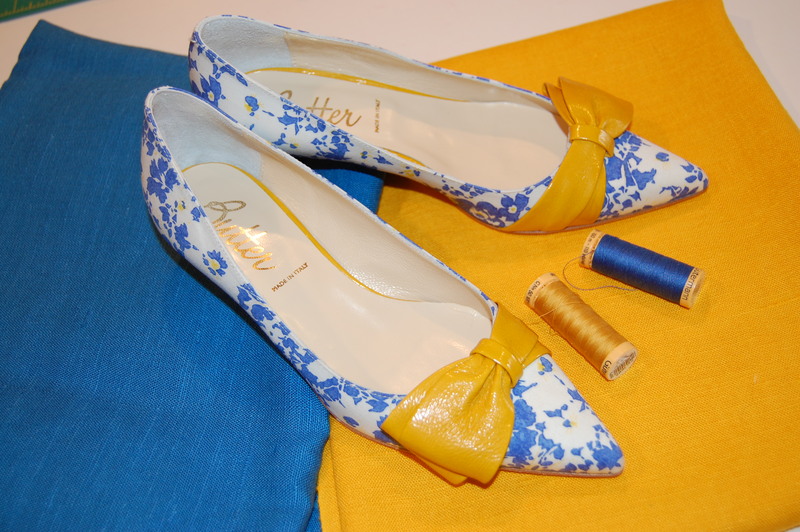 What a fabulous combination of colours, fabric, buttons and shoes! Vogue will be calling shortly, for a photoshoot. You have me laughing! Glad you like the outfit – and thanks so much for your comment. Stunning ensemble! The shoes are just so perfect. My ensembles invariably start with the shoes. Recently I spied a pair of cream, red and navy sling backs at Kate Spade which I left there because I couldn’t justify the $300+ price tag (and I was traveling so luggage space was a premium due to the haul I got at Britex in SF), they are now haunting me as suddenly everything in my stash would go so perfectly with them. I love to use couture techniques on “simple” designs as it is a great opportunity to practice your techniques without dealing with complicated construction. We always remember the shoes that we should have bought and didn’t (in our attempt to be practical…) I feel your pain! However, a suitcase full of fabric from Britex is some consolation! I have learned so much by using couture techniques on simple designs… So gad you like the outfit! Beautiful dress with absolutely perfect shoes! I love the color combination and how the buttons make it look so complete. I think without the buttons it looks a little more like separates instead of a dress. Such a cheerful dress! Thanks, Brooke! I’m glad you agree with me on the buttons – always good to get confirmation on ideas! Lovely job on your dress, and the match to the cute shoes is wonderful! Wear them well! I will wear them well! Wonderful to hear from you! Oh my gosh, what a great eye you have!! You are so right about the Liberty fabric. When I was pining over these shoes (before I had the chance to get them in my size), I saw a short reference that the fabric in them was Liberty. But then I could not find that reference when I finally purchased them. Thanks so, so much for the link! Absolutely lovely outfit! I enjoy reading your stories..
Ah, thank you, Jackie! I am so glad to have you as a reader! ANOTHER darling dress from the Dress Princess! beautiful sewing and your thought process that brings it all together in a glorious finish. You have a wonderful talent. What a perfectly lovely comment and compliment. Thank you so very much! The dress is fantastic and the shoes were kismet. And on sale! With emphasis on SALE! Always fun to hear from you! Love the color combination and the shoes are perfect. Buttons are a definite yes. Oh, good, more confirmation on the buttons! Thanks so much, Mary! So fresh and lovely. Amazing. You are really something! I really love what you are doing with the linen and remember it well. I’ll share one of these days. I’m not certain but I think your pattern is the one that I used for my bridesmaids dress from what, yes, Moygashel Linen. My dress was linen also…bell shaped skirt as was hers. 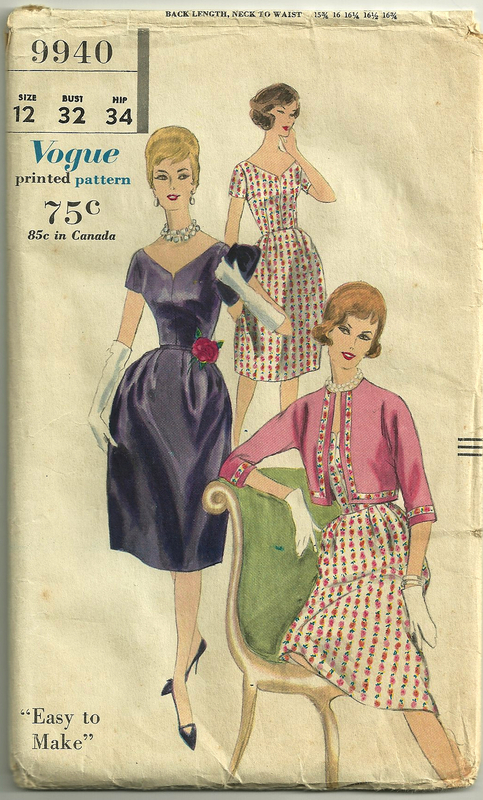 Dresses cost me $65 in 1961 or 1962. I must look for a picture to share. In case you don’t remember me, I sat next to you at Coutour. I really look forward to seeing you again and enjoying all your beautiful creations. Of course, I remember you, Sheila! Well, I can’t wait to hear more about your Moygashel linen wedding and bridesmaid dresses. Lucky you! OMG, that is KILLER! I love those shoes…very good choice on the purchase. When you think about something for long enough you know it’s love. That dress is fantastic and I love the colours..nice job on the lining too and the buttons are uber cute. Those Dior shoes…sigh…. Thanks, Kat! I felt so, so lucky to get those shoes! Glad you like the buttons – and yes, those Dior shoes are something else, aren’t they?? “Sigh” is right! What an awesome dress. And made even more so by those fabulous shoes! Thanks and thanks! Glad you like both dress and shoes! Oh, thank you! I am very flattered by your comment! Love the entire ensemble — from your exquisite workmanship down to the color combination to the white belt. I like the buttons with it and the shoes are simply serendipitous! What are we going to do without Pat??? Hoping someone will buy her business! Thanks, Cissie! Glad you like the buttons – so do I. And – I am very happy with those shoes!! I don’t know what we are going to do without Pat… That news really took the wind out of my sails – but, maybe someone WILL buy her business, which would be such a great solution for both her and all of us! This is just fabulous. The dress, the button detail, the choice of colour and fabric and the flawless construction are awesome, but the shoes – well they are just perfect. This ensemble is perfect on you. Ann – thank you! I am not sure this dress would be quite the same without those shoes! I so appreciate your comment. What a lovely outfit!It is very flattering, and I too applaud the buttons. Question: is the underlining and fashion fabric treated as one, ie basted or sewn together to start? And when you say twill tape is on the outside “side”, is that the side of the roll closest to fabric edge or front of the bodice? I’ve just gotten the muslin fitted for a dress along with pants & top so I’m ready to underline a bodice! Thanks for your informative and fun site! Thank you, Heather, so much! So far it is unanimous about the buttons, which makes me very happy! To answer your questions – yes, the twill tape is on the side of the roll closest to the fabric edge. This way, the small stitches with which I applied it do not show on the right side of the fabric. 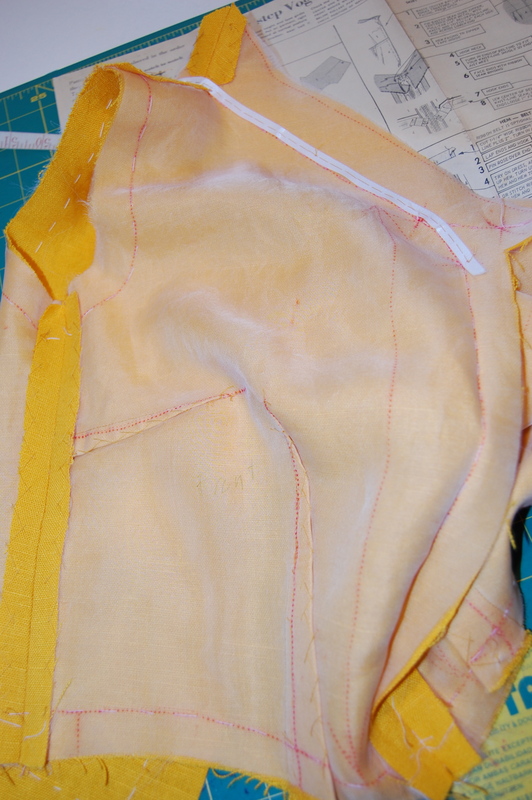 And – I baste the silk organza underlining and the fashion fabric together along the seam lines. The two are then treated as one. 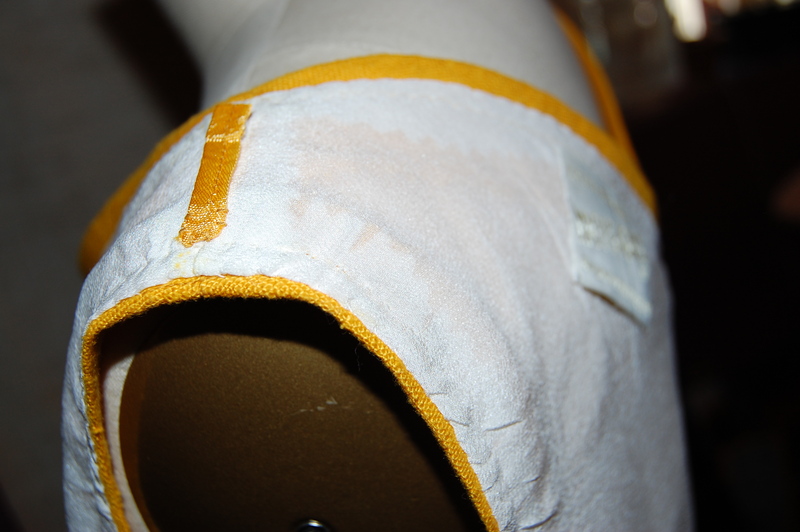 Then, I use those basted seam lines as my sewing lines. You may already know that, generally, couture construction has wider seam allowances than the standard 5/8″ (here in the USA), so having a basted stitching line to follow is a crucial part of the construction of a garment. Thanks so much for reading and commenting! Simply stunning! And the shoes – perfect. Thank you, Janene! I so appreciate your comment!